Looking to the following photo taken in 1970, with the construction of the M8 well under way, am I correct in assuming that the yellow dot demarcates where the warehouse of James Ferrigan (Chief Architect of the SCWS) stands? If not, where is Ferrigan's edifice? I was also under the impression that the SCWS building (red dot) had a similar, neighbouring building to the right of this photo (where the legs of the M8 overpass have been set). In fact, this photo shows the SCWS building to the left, and this other building to the right - anyone know what it was? To my knowledge when I worked with the CWS the building with the yellow dot was used by the Dairy department of the then SCWS. I don't know how accurate my information is but many colleagues used to go into this building for up stairs in the top of the building was a common room for staff with old billard and table tennis - they would 'sneak' in and play the odd game (building was officially closed, out of bounds) and they always said you could still smell the odour of cheese and there were remnants of the stuff ouzing out of floorboards. Timchilli, I think the building to the right hand side (west) of the SCWS building was a big block of mansion like tenements. I could be wrong. My folks were from down there and i know that behind this block of tenements? were more of the standard less grand tenemental properties. The area of Kingston was completely decimated for the bridge to be built. I heard about the SCWS and the cheese odours also. Apparently they had some bother when cleaning / repairing the Sandstone as the natural occurring chemicals from the Cheese had got right into the Sandstone and had caused it to deteriorate. So Socceroo's most likely right. That building to the right is actually about the best part of 100 yards forward of the SCWS building. That is the corner of a tenement block in Springfield Quay right at the Clydeside. Remember back then, you had the Kingston Dock still to be filled in, in front of the SCWS building. Timchilli wrote: Looking to the following photo taken in 1970, with the construction of the M8 well under way, am I correct in assuming that the yellow dot demarcates where the warehouse of James Ferrigan (Chief Architect of the SCWS) stands? If not, where is Ferrigan's edifice? 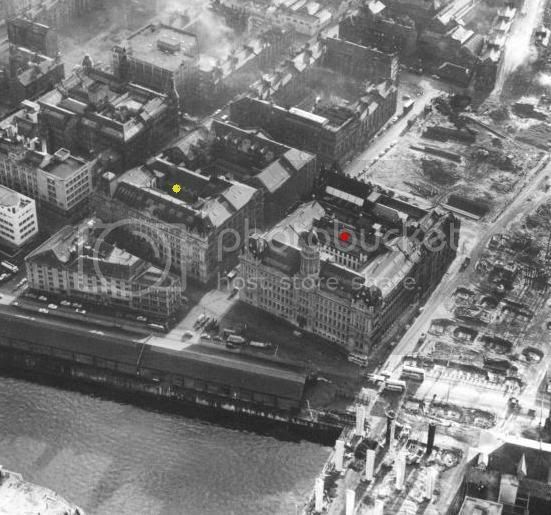 Tim:the building located where you have the yellow dot, was 71, Morrison St. and was the head office of the SCWS Grocery Dept. There were two parts to the building separated by a lane way: the part further removed from Morrison St. was the Storage Dept. ; the part with the frontage on Morrison St housed the office of the General manager and all the Grocery buyers' offices on the second floor, and a varity of grocery depts on each of five floors. (One of these grocery departments was the Cheese Dept, and this will explain the " stuff ouzing out of floorboards" mentioned by Delmont.). I don't know anything about James Ferrigan, but I do know the building with the red dot was the head office of the SCWS at 95 Morrison St. and contained the board room and all the financial offices on the second floor, as well as a variety of departments on the upper floors (Toy Dept, Jewelry Dept., for example). The ground floor of the back end of the building was taken over by the Fruit Dept after the original Fruit Dept, on the other side of Morrison St, got a direct hit from a land mine in the Blitz. There was no "...similar, neighbouring building to the right of this photo". There was a low one-storey building immediately west of 95 Morrison St. This was the Fodder Dept of the SCWS, and there was a temporary corrugated-tin, one-floor, storage building built here as well. Just south of this 'tin' building was a" a big block of mansion like tenements." as mentioned by Soceroo--this was just across the road from the west side of 95 Morrison St. at the west end of Wallace St. 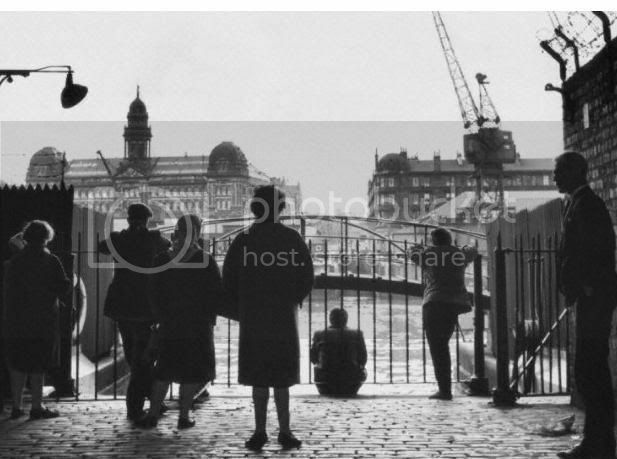 There was a "corner of a tenement block " at the side of the Clyde, and it was, as Schiehallion mentions, closer to the Clyde than 95 Morrison St. This was right across the road (forget its name, but it becomes eventually, Paisley Road West.) from the SCWS Fodder Dept. A great picture. Hope this helps you. Cheers, Dugald. The building in front of the Grocery Department, marked with the yellow dot is in fact 119 Paisley Road and I don't know it's original use but up until recently and for a number of years belonged to the SCWS, then CWS Funeral group (this merged with the English CRS and became the Cooperative Group and Funeralcare resided there) The funeral division has since moved over to the old Grocery Dept building and 119 is to be redeveloped - would you like a house in that old building with its history? Delmont St Xavier wrote: The building in front of the Grocery Department, marked with the yellow dot is in fact 119 Paisley Road and I don't know it's original use but up until recently and for a number of years belonged to the SCWS, then CWS Funeral group (this merged with the English CRS and became the Cooperative Group and Funeralcare resided there) The funeral division has since moved over to the old Grocery Dept building and 119 is to be redeveloped - would you like a house in that old building with its history? Delmont, the original use ( well as far back as the early 40's anyway) of the building at 119 Paisley Rd. was as the SCWS Funeral Dept. It was right beside Fruit Dept building that was destroyed in the bombing and was itself badly damaged, but it never closed down. They did quite well during the war through having quite a lot of business associated with the American troops in transit via the Clyde. And 'no', I wouldn't like a house in that old building... oozing cheese is one thing, but oozing blood and embalming fluid is another! I notice in Tim's picture that the building to the left of the one with the yellow dot, is not the one that I recall from these early years. There use to be a building with just the same facade and size as that of the Grocery building at 71 Morrison St.. This was the Stationary Dept, on Morrison St., and the Drapery Dept on the Wallace St. side. I might mention also, that the right-hand side of the building across from the Grocery Dept on Wallace St, was the SCWS Dining Room--the scene of many a grand formal evening of celebration during the halcyon years of the SCWS. off topic kinda but from that angle the water seems kinda close to those buildings , when heading to work everyday that area of land seens a lot wider than it does in the photo, perhaps im having a dumb moment and theres a possible explanation. 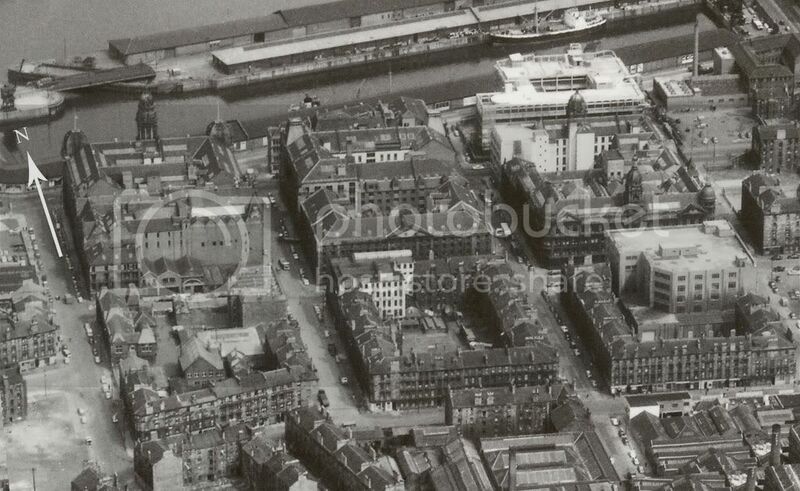 The water you see in that aerial shot is actually Kingston Dock which has since been filled in meaning the Hypermarket is now further back from the Clyde. The filled in land now has yuppie flats. Do they still call them yuppie flats nowadays? Kingston area viewed from the south with the dock still in use. From this angle you can appreciate the size of the buildings.